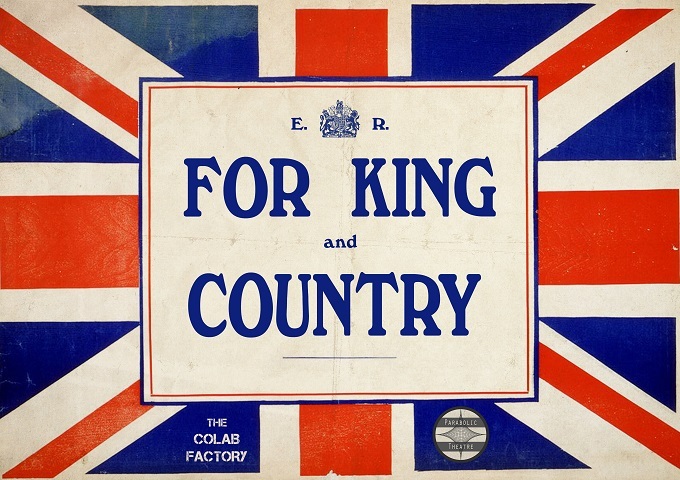 Previously known as Keep Calm and Carry On, For King and Country is an immersive gaming experience from Parabolic Theatre that takes place in the CoLab Factory near London Bridge. Right from the start, there’s a perceptible confidence running through the performance, with an assured welcome at the door encouraging us to step into our coming roles but equally able to handle the more reticent groups and give them time to settle in. Being regular visitors to the CoLab Factory, we’re well acquainted with the venue, so it’s always interesting to see how companies choose to fill the space. It’s a large area, with plenty of corners that they’d made good use of as well as a large central space that served well to bring the audience together regularly and ensure that everyone experienced a common narrative. They hadn’t gone to town with the decoration, but that minimalism worked well with the war bunker storyline. On first arrival, it felt a little overwhelming as we tried to take in all the possible scenes and get a handle on what we were meant to be doing. We soon found our feet, though, with the help of some opening theatre that brought everyone together and set the trajectory for the evening. The level of involvement you take is, to some extent, decided at that moment, but it’s very much down to the individual player. This is immersive theatre where you can choose to be front and centre or just float around the edges. While they do make a good effort to let everyone take those central roles, you need to seize the opportunity when it’s presented because, after that introductory section, you don’t really get a second chance. I was looking for something in between and found that trickier than I’d expected. If you don’t have an assigned role, you’re encouraged to cycle between different scenes. That gave more variety of experience but at the cost of a far shallower interaction and a feeling of constantly trying to catch up with more central players. I eventually gave up and stuck to one section that appealed to me, but I felt at a significant disadvantage. That part of the experience favoured one or two people taking active roles, and it was hard to really have much of a say if you’d joined halfway through. Consequently, I sometimes felt a lack of agency, struggling to take meaningful actions and, when I did, it wasn’t clear how much they genuinely affected the high-level course of events. In fact, that lack of agency was something I experienced more generally. At times it felt like the show had a destination that we couldn’t prevent it from reaching although, even if that had been the case, it was clear that we did have an influence on the route. As we found out later, it wasn’t just that the actors would react to what we said: there was an external games master coordinating the responses to our actions, trying to make the outcome as realistic as possible – and, from my point of view, succeeding. The game culminated with a big finale that brought the whole experience together. Where most immersive experiences end with actors playing out the final scene, here the whole audience took an active part, to whatever level they chose. It truly was one of the most impressive finales I’ve seen, managing to blend game, immersion and physical theatre into an exciting ending. While at times I may have felt a little lost, and even frustrated, by the end everything had been pulled together and made sense. The combination of constant, strong theming during the game, high-quality acting, an interesting story and an impressive finale resulted in a great experience. I just wish the game aspect had been a little more accessible. Have faith that they know what they’re doing and I’m sure you’ll come out the other side having had a fantastic time. Full disclosure: I wasn’t charged for my ticket. That doesn’t influence the review – you can read more on the About page.